Son of Gray and Edith Leaver; husband of Phyllis Leaver, of St. Annes-on-Sea. A.R.C.A. A former well-known Burnley artist, Mr. Noel Stanley Leaver, A.R.C.A., has been accidentally killed while serving as a Cadet with the Royal Artillery. The funeral, at which military honours will be accorded, will take place at St. Mary's Mellor, Blackburn, at 12-30 p.m. to-day. Aged 33, Mr. Leaver who was the son of Mr. and Mrs. Gray Leaver, formerly of Simonstone, and now of Southport, was educated at the Widnes Secondary School and Burnley Grammar School, afterwards being engaged by Messrs. Procter and Proctor, accountants. Following two years in accountancy practice, he became designer to Messrs. Alex Drew & Sons. Ltd. Lowerhouse, where he gained considerable experience in the practical side of cotton printing. A student of the Burnley School of Art under Mr. W.M. Whitehead, A.R.C.A., he passed the Board of Education examination in Cotton printing, Part 1 and Part 2 industrial design Proceeding to the Manchester School of Art in 1932, he made a continued study of industrial design, and was awarded the first prize given by the Textile Institute for printing textiles, and received the diploma of the Furnishing Trades Organisation for designs for carpets. Mr. Leaver entered the Royal College of Arts in 1933, having served under Sir William Rothestein and Professor P.E. Jowett, A.R.C.A., and making specialised studies in cotton printing, stained glass, etching, metal work, pottery, mosaic and general commercial art. He attended the London County Council School of Arts and Crafts for weaving under Professor Taylor, and was appointed student demonstrator in charge of cotton printing in the Royal College of Art. He also completed the course of pedagogy under the L.C.C. and was twice awarded the free studentship of the Royal College of Art. Mr. Leaver, in 1936, secured the diploma of the Royal College of Art, South Kensington. In 1938 he was appointed lecturer in art at Chelmsford Technical College, and he held that appointment at the time of his joining up in October 1940. Many examples of the artists work had been exhibited notably in the Federation of British Industries Exhibitions, 1935-1936; L.C.C. art in industry exhibition, 1936, Heals, Tottenham Court-road, 1934; New Castle School of Art, 1936, and the Royal College of Art exhibition 1936. Mr. Leaver followed his uncle, Mr. Noel H. Leaver, A.R.C.A., the noted water colour artist in his success in the field of art. His father, Mr. Gray Leaver, was well-known in this district up to the time of his going to reside in Southport about seven years ago. Mr. Noel S. Leaver, in 1938, married Miss Phyllis Worswick, who was a member of the staff of the Clitheroe Post Office for a number of years. He is also survived by one child, a boy. It was stated at the inquest, held by the Oswestry Coroner, that Leaver's wound was caused by a bullet ricocheting from a stone or wall in a valley in North Wales, where battle training was in progress. The evidence showed that he would not have been struck from the direct firing of a Bren gun. A military pathologist said in his opinion, the bullet, after ricocheting, entered the back of Leaver and penetrated the vertebrae. The bullet struck the edge of Leaver's steel helmet before entering his body, and in his (witness's) opinion, if Leaver had not been wearing the steel helmet the bullet would have missed him altogether. "Accidental death" was the verdict. LEAVER.-Noel Stanley, A.R.C.A., Cadet, 133 O.C.T. Group, R.A., beloved husband of Phyllis (nee Worswick), and eldest son of Gray and Edith Elizabeth Leaver, accidentally killed June 28th, 1943, aged 33 years. Interment, St. Mary's Church, Mellor, near Blackburn, today, at 12-30 pm.-23, Emmanuel road, Southport. A bullet ricocheting during a battle exercise in North Wales was given as the possible explanation of the death of Gunner Noel Stanley Leaver (33), a cadet in the O.T.C. group, formerly of St. Annes-on-Sea, at an inquest held by the Oswestry and District Coroner (Dr. W. B. Aylmer Lewis) at the Shropshire Orthopaedic Hospital on July 1st. Lieut. Alexander Roney, R.A., who gave evidence of identification, said that during a battle exercise on Monday, June 28th, Leaver was one of the cadets taking part. The scheme roughly was that the cadets moved up from the valley and Bren guns were firing and various battle noises were produced. On three occasions they had to lie flat whilst the guns were firing and go forward again when the Bren guns ceased firing. Jut before charging the hill the cadets fixed bayonets. It was found that Gunner Leaver had not got up and witness went down the hill and found Leaver lying on this face. He was facing the objective. Witness turned Leaver over and saw a wound on the left side of his face by the lower left jaw. He felt his pulse and his heart was beating. Witness called for stretcher bearers and Leaver was taken to the camp reception station. In reply to the Coroner, witness said the Bren guns were on the left and they were not firing directly overhead, and they did not fire when the men were advancing. He had never known an accident of this kind happen before. Answering P. S. Harper, witness said he was not engaged in the charge and could not say from what angle the Bren guns were firing. Major John Holmes Keall, a military pathologist, who carried out a post mortem examination of the body, gave evidence of the wounds and said, in his opinion, the bullet, after ricocheting, had entered Leaver’s back, causing an extremely large and jagged wound approximately three inches long and came out by the lower left jaw. There was no scorching of the skin. There was no exit wound in the back and no bullet was recovered from the body. The cause of death was haemorrhage and shock from a gunshot wound. In reply to P.S. Harper witness said the bullet struck the edge of Leaver’s steel helmet before entering his body, and in the opinion of witness if Leaver had not been wearing his steel helmet the bullet would have missed him altogether. Capt. Arthur John Bird said that at the place of the battle exercise-and he was not in charge of it-there was a valley 50 or 60 yards across, and it was boggy. Four Bren guns were on the left-hand side of the valley. The cadets were in line, shoulder to shoulder, straight up the valley. Several times they would go down flat whilst the Bren guns were firing but the guns were not firing overhead. There was no firing from behind the men. The Coroner: If this exercise is properly carried out there should be no firing danger at all? – No. About how many cadets were there? Altogether about 32, divided into two squads. The first squad had completed the exercise without any trouble? – Yes. In further answers to the Coroner witness said they did not notice any holes in Leaver’s tunic and the accident must have been due to a ricochet – probably a ricochet from a stone. This was the only possible explanation he could give. P.S. Harper: Was there any exercise of pulling back the rifle bolts during this battle exercise? – None at all; only the bayonets were fixed previous to the last assault. There was no exercise of firearms at all. Lieut. 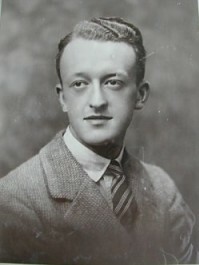 Basil Edward Rowland told the Coroner that when the second squad had finished the exercise he noticed one cadet was absent and he found Leaver lying on his face. He saw Leaver had a big gash under the left jaw. He was attended to immediately. Cadet Robert Russell said he was taking part in this battle exercise and under the last burst of fire he was prone on the ground, about six inches away but practically touching Leaver. The officer in charge gave the order to fix bayonets. Witness glanced to the left when getting to his feet and saw Leaver lying flat. At the time witness thought he had fainted or had lost his breath and he would get up and follow, so witness carried on with the attack. Replying to the Coroner, witness said he did not hear any abnormal sound during the last burst of fire, and he did not hear anything like the sound of a ricochet or anything of that kind. P.S. Harper: Was there any cadet in the rear of Leaver? – I did not see one. Cadet Ernest Raymond Shaw, who also took part in the battle exercise, said he was on Leaver’s immediate left, almost touching him. After the firing of the Bren guns they were given the order to charge and witness got up. He noticed Leaver did not get up so he shook him and got no reply. Witness was given the order to advance, and as soon as he could he left the line and informed the officer about Leaver. In reply to the Coroner, witness said there was nothing abnormal about the sound of the firing and he did not hear the sound of a ricocheting bullet. Another witness told the Coroner that during the exercise all the men were in line and there was no cadet behind. The Coroner said that on the evidence placed before him he would record a verdict that Leaver met his death accidentally, and that the cause of death was haemorrhage and shock from a gunshot wound sustained whilst engaged in a battle exercise. He thought that this battle exercise appeared to have been carried out in a perfectly safe manner. The only explanation he could think of was that Leaver’s wound was caused by a bullet which had ricocheted after hitting a stone or a wall in the valley and struck him in the back, passing through the jaw. The evidence showed quite conclusively that Leaver could not have been struck from the direct firing of a Bren gun. Clearly it must have been a ricocheting shot from the opposite side of the valley. Such a chance of death in a manner of that kind would, he imagined, be a million-to-one chance. He expressed his sympathy with the relatives. P.S. Harper also expressed sympathy with the relatives. 1944 – LEAVER Noel Stanley of 26 Greenways Broomfield road, Chelmsford died 28 June 1943 at Park Hall Camp Whittington near Oswestry, Shropshire. Administration Liverpool, 26 January to Phyllis Leaver, widow. Effects £470 8s. 3d.